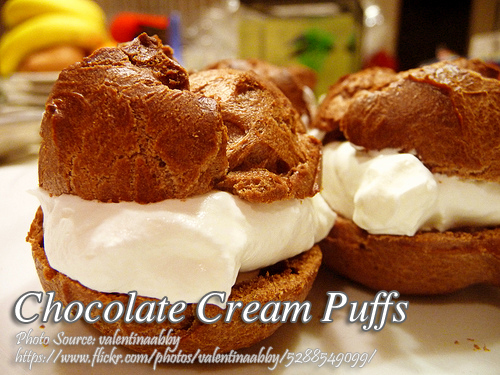 Searching for a chocolate flavored meringue? Try this nutty cocoa meringue kisses. 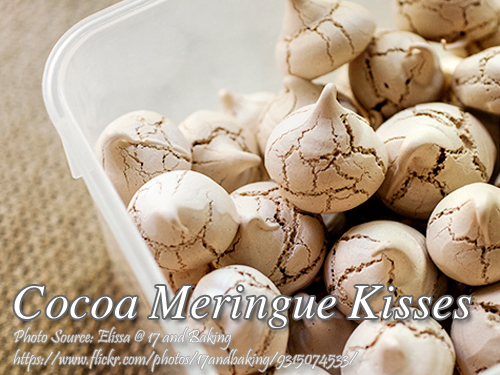 Making this chocolate flavored meringue is very easy and uses very simple and few ingredients. And with regards to the pecan nuts used in this recipe, you can substitute it with almonds, cashew or peanuts. Position rack in upper third of oven and preheat to 325 °F. Prepare 2 non stick baking sheet or lightly oil 2 baking sheets. Beat egg whites at medium speed until foamy. Add cream of tartar and continue beating until soft peaks form. Add ¼ cup of the sugar, a tablespoon at a time, and beat until egg whites are stiff and shiny but not dry. Sift cocoa, cornstarch and remaining ¼ cup sugar together. Sprinkle half of the mixture over egg whites. With rubber spatula, gently fold in just until blended. Repeat, folding in remaining cocoa mixture, then add pecans. Spoon mixture into pastry bag fitted with ½ inch star tip. Pipe 1 to 1¼ inch rounds onto prepared sheets (or drop by teaspoonfuls). Bake until set, about 35 minutes. Cool slightly. With spatula, gently transfer meringue kisses to wire racks to cool completely. (Maybe prepared a day ahead) Store airtight at room temperature. Make 60 meringue kisses.